I skipped not just one but two SavingsPinay Quick Recap. I'm so sorry for I got too busy working as a freelance content writer by night and weekends. I tried to balance everything but somehow there is something that will really suffer. So to cut the long story/explanation short, I decided to limit my freelance writing gigs to just 3 clients and still do event hostings on the weekends. I also develop this massive content writing thing from Friday night to the wee hours of Saturday to come up with at least one week worth of content. My productivity system is not yet in its perfect state but I am slowly but surely getting there. So please bear with me if ever I lack post sometimes here and on my other blogs, IzzaGlino and PinayOnlineRakitera. Without further ado here's SavingsPinay August Quick Recap! 1. We hit 70,000 Pageviews!!! WOW!!! I can't believe that we will hit this mark ever. On my last recap I told you guys that we hit 50,000 mark and now we are in 70,000 already!!! I guess it would be a great Christmas gift if ever we hit 100,000 before 2015 ends. (We can do this right?!!!) Thank you so much for visiting my blog often and reading my posts. 2. Freelance Content Writing Update. As I mentioned on last recap I've been doing some freelance content writing as an addition to my multiple income stream. For the last two months, June and July, I was managing five different clients/projects which was so hard for me knowing I have my daily job and I also maintain two blogs. I slowly gave up the other two accounts and decided to just focus with the top three clients that make me happy and that pays well (wink!) If you wanted to start a career in online then make sure to check out my new blog, PinayOnlineRakitera. I give valuable information on freelance writing, blogging, becoming a virtual assistant and more. 3. I got a St. Peter Life Plan. I know this is a surprise but yes, I did it. When I heard that my parents is done with their St. Peter Life Plan I was totally convinced to get one. It is a cheap investment and something that I know will be a great help for my family and my future family. Read: St. Peter Life Plan: Is it Worth the Investment? 4. Sponsored Posts and Blog Opportunities. For the past months I was able to receive sponsored posts and blog opportunities which I will always treasure. As always whenever I have an sponored post I try to give my full views and opinions. You can check out my post Store Spotted: Heart Press Philippines and Finding the Right Wedding Dress for Your Body Type for samples. 5. 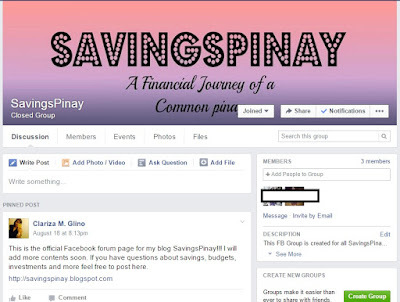 Join SavingsPinay's Facebook Group!!! 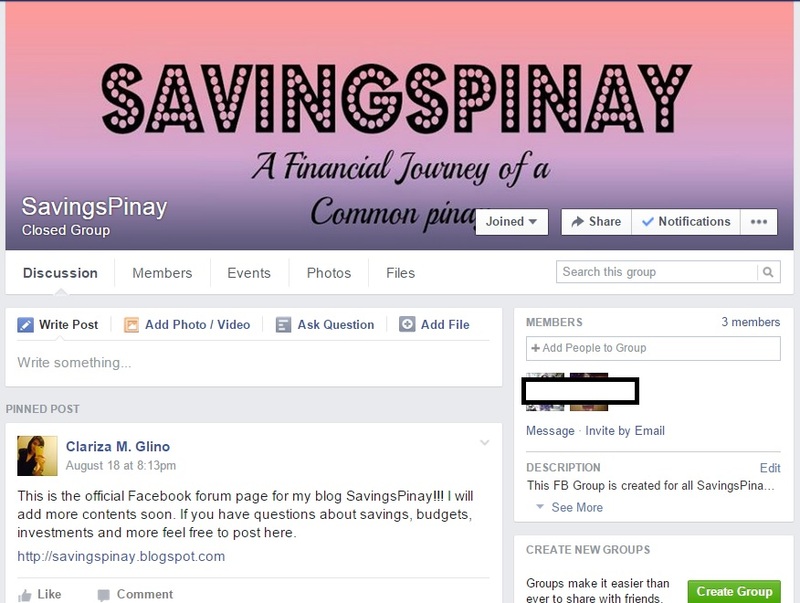 I finally decided to create a dedicated page/group for SavingsPinay's readers. I wanted to create a community where every member can see the posts, asks questions and give valuable information about savings, budgets, investments, business and more. I just started the FB Group so you can also see a free downloadables album of some of SavingsPinay's Infographic. But I do encourage you to join. (MOST VIEWED) St. Peter Life Plan: Is it Worth the Investment? How did your month went?! Did you enjoy AUGUST?! Hope you are pumped up for the coming month!